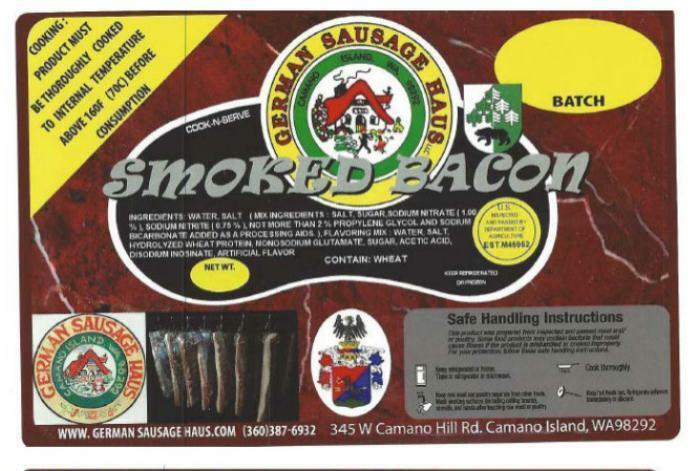 German Sausage Haus of Camano Island, Wash., is recalling approximately 1,252 pounds of Heat Treated, Not Fully Cooked-Not Shelf Stable (HTNFCNSS) meat products. A possible processing deviation may have led to staphylococcal enterotoxin contamination. The recalled products, bearing establishment number “Est. 45952” inside the USDA mark of inspection, were produced were distributed for institutional use and shipped to retail stores in Washington State. Consumers questions about the recall may contact Jan Urbanovic at (360) 387-6932, or by email at germansausagehaus@gmail.com.